Discussed in this essay: The Wall and the Gate: Israel, Palestine, and the Legal Battle for Human Rights, by Michael Sfard. Metropolitan Books, 2018. 528 pages. 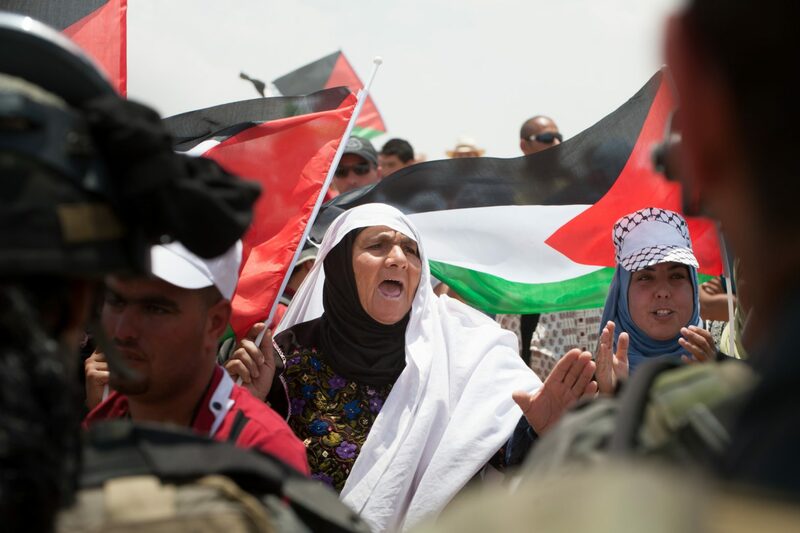 Freedom and Despair: Notes from the South Hebron Hills, by David Shulman. University of Chicago Press, 2018. 206 pages. ISRAEL’S OCCUPATION of the West Bank will not last forever—nothing does. But it is hard to see how it will end. There are now more than half a million Israeli settlers living in the West Bank and occupied East Jerusalem. The Israeli right has so consolidated its power that even if Benjamin Netanyahu, in his 12th year as prime minister, loses in the upcoming 2019 elections, the territorial maximalist agenda is unlikely to be imperiled. The central committee of Netanyahu’s Likud voted unanimously last January in favor of annexing the West Bank, and the Knesset has already begun the annexation process through gradual legislation: for example, placing Israeli universities in settlements under Israeli sovereignty and retroactively authorizing thousands of housing units built on privately owned Palestinian land. The IDF and the Shin Bet, in the words of a retired general, have “elevated the occupation to an art form”—a feat that would have been impossible without the consistent collaboration of the Palestinian Authority’s police and intelligence agencies. After more than half a century, Israel’s military rule over the 2.5 million Palestinians in the West Bank has never seemed more unshakable, like it could go on for another half century, or even indefinitely. In these dark times, there are few reasons for hope. And yet countless Israeli activists, whether through NGOs or informal collectives, in the halls of the Supreme Court or in physical solidarity with Palestinians, refuse to give up. Two such Israelis, Michael Sfard and David Shulman, have recently published books about their experiences on the frontlines of the anti-occupation struggle. Sfard’s The Wall and the Gate: Israel, Palestine, and the Legal Battle for Human Rights and Shulman’s Despair and Freedom: Notes from the South Hebron Hills are very different books that deal with disparate aspects of the occupation’s vast apparatus, but both model methods of resisting the occupation—Sfard, through legal advocacy, Shulman, through nonviolent direct action—and of maintaining hope while doing so. Their hope that the occupation will one day end is relentless: an almost prophetic faith that time, eventually, will render justice. Few know the cruel inadequacies of Israel’s judicial system—the fleeting successes and crushing disappointments, the low odds and high stakes—that characterize social change litigation in Israel better than Michael Sfard. In The Wall and the Gate, the veteran attorney traces the legal history of the occupation through detailed case studies of the major issues that have defined the Israeli Supreme Court’s occupation-related jurisprudence: deportations, settlements, unauthorized outposts, home demolitions, targeted assassinations, the separation barrier, administrative detention and torture. The book is a valuable resource not only for scholars but also for activists, attorneys, and anyone seeking to understand the mechanisms of social change; Sfard closes each chapter with an assessment of what worked and what didn’t in the particular cases, and consistently raises questions about what constitutes success in a situation where the source of injustice is the system itself. The Wall and the Gate is a crucial text for understanding how Israel’s occupation of the West Bank and siege of Gaza became a permanent feature, rather than a temporary bug, of the modern Israeli state. It is also, in part, a tribute to the brave and tireless Israeli lawyers, like the late Felicia Langer, who risked their careers, and sometimes their lives, for Palestinians’ rights. Sfard tackles head-on the ethical and strategic dilemmas that lawyers face in the fight against the occupation. Of those dilemmas, the problem of complicity troubles him the most. How does one work within the strictures of a system designed to oppress and dispossess when doing so legitimizes and strengthens that system? The book’s title refers to an example of this, a case of Palestinian farmers cut off from their land by the separation barrier. Removing the barrier entirely would be practically impossible; it would require a drawn-out legal fight with slim chances of success. But a gate can be made with relative ease, to quickly provide the farmers access to their land. Asking the army for the gate, however, means accepting the legitimacy and immovability of the fence, lending the occupation the appearance of a functional, just system where recourse to address abuses is possible. For human rights lawyers, Sfard writes, “it means putting ourselves in the position the army would like human rights activists to be in: collaborators in the management of a human rights violation.” The occupation’s ability to consistently put human rights lawyers in this double bind, Sfard shows throughout the book, is partially what has made it so enduring. But refusing to take occupation-related cases to court is not an option. That, Sfard argues, would mean abdicating the human rights lawyer’s moral responsibility not only to achieve the best possible outcome for a client, but also to articulate the terms of the struggle for justice, or, as he puts it, “the wording of its manifesto.” Sfard makes a valuable theoretical point here about the role of the lawyer in political struggle as a kind of organic intellectual, whose legal work furnishes the movement for social change with the language around which it can mobilize. This is also a powerful rejoinder to impatient, would-be radicals who see no advantage to “working within the system.” Sfard knows very well just how monstrous the legal system can be, yet, as the various case studies demonstrate, working within it is often an essential step toward making substantive changes that could save homes and lives. The vast majority of The Wall and the Gate is devoted to analysis of cases brought before Israel’s Supreme Court. (Petitioning the Court is one of the few means Palestinians in the West Bank have of challenging the policies that govern their lives.) The cumulative effect of this focus on the Court is to show the occupation as an integral part of the modern Israeli state; it is not, as some liberal Zionists prefer to view it, an unseemly appendage to an otherwise healthy democracy. Instead, the occupation and contemporary Israel are co-constitutive; where one ends and the other begins has become more difficult to determine, as settlements and the separation barrier erase the Green Line demarcating the West Bank from Israel proper. The Supreme Court determines the fates not only of Israel’s roughly 8.5 million citizens, but also of the roughly 4.7 million Palestinians living in the West Bank and Gaza, a population with no say in the polity that determines the Court’s composition. The justices’ assessments of the domestic political climate in Israel—for example, whether they feel they can politically afford to rule in favor of Palestinians—shape their decisions on issues related to the occupation. Many of the court’s most influential justices made their careers defending various brutal practices of the occupation as army lawyers and state attorneys before taking the bench; the architects of the occupation and the architects of modern Israel are largely the same. There is, perhaps, no better of example of this than Meir Shamgar: military advocate general in 1967, an early co-author of military law in the occupied territories, and, later, Supreme Court President from 1983 to 1995. DAVID SHULMAN shares this stubborn, almost messianic kind of hope. “Someday the occupation will end,” he writes towards the close of his new book, Despair and Freedom: Notes from the South Hebron Hills. A veteran member of Ta’ayush, an Israeli group that works with some of the poorest and most vulnerable Palestinian villages, Shulman has witnessed the abuses that Sfard attempts to prevent in court. Like Sfard’s The Wall and the Gate, Shulman’s book is a product of an Israel whose skies have darkened, and, like Sfard, Shulman refuses to surrender to the darkness—though he could hardly be blamed if he did. Despair and Freedom combines Shulman’s testimonies from the southern West Bank’s rocky hills with meditations on agency, existence, freedom, hope, truth, and what oppression does to the selves and souls of both oppressors and oppressed. The book is at once an agonizing portrait of the occupation’s brutality and a philosophical guide for those resisting it. Shulman eloquently and sensitively captures the beauty and the horror of the occupied West Bank. He is deeply attuned to the particularities and the paradoxes of the place. Of the Palestinian shepherds with whom he works, Shulman writes, “There is a bitter contrast between the wide-open vistas of the desert and the utter absence of freedom to move, even breathe, that lies at the base of their experience.” He does not romanticize their difficult lives, nor does he condescend. His ability to render the fullness of their humanity makes the accounts of their suffering all the more painful to read. After describing a series of especially violent attacks by settlers and soldiers against the Palestinians of the South Hebron Hills, Shulman writes, “There are moments you could weep that human beings could be like this.” It is a testament to Shulman’s skill as a writer that the reader often feels like doing so. Despair and Freedom offers a philosophy of resistance that centers this kind of tenacious hope—a “hopeless hope,” in Shulman’s words—and goes beyond it. According to this philosophy, the fundamental ethical and existential act from which all hope springs is embodied opposition to oppression. “‘No,’ the music of defiance, is a word that, in a critical situation, creates the alive human person,” Shulman writes. Elsewhere, he adapts Descartes’s maxim to a life lived through perpetual, nonviolent resistance: “I protest, therefore I am.” In the current age of catastrophe, it is hard to think of a more appropriate vision for how to live than this. Joshua Leifer is an associate editor at Dissent. His writing has also appeared in Jacobin, The Nation, and n+1.